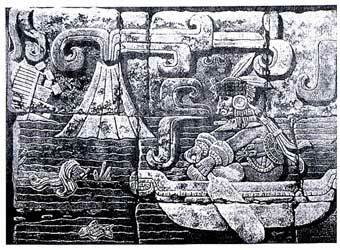 The beginning of a continuous bas-relief frieze discovered by Maler in Yucatan, which suggests to a remarkable degree the Atlantean cataclysm. The above photograph describes a pyramid and temple collapsing, a volcano in eruption and the land sinking. The figure in the water suggests destruction of life by drowning. Many escaped as symbolized by the figure in the boat.